A lead magnet is a landing page or an offer (usually free) dedicated to giving your website visitor some relevant value in exchange for their contact information (at the very least, a email address). It's a great way to build your contact database, and Boma can help you set up this flow in a fast and easy way, and get those contacts building up your Boma list! Go to Landing Pages in your top menu. You'll be taken to the editing page. Here you can further customise your page by editing the page name, body text and contact fields you want to collect e.g. first name, last name, email address, phone number etc. You can also add a tag to those who come to your mailing list through this page so you can easily filter your contacts at a later date. 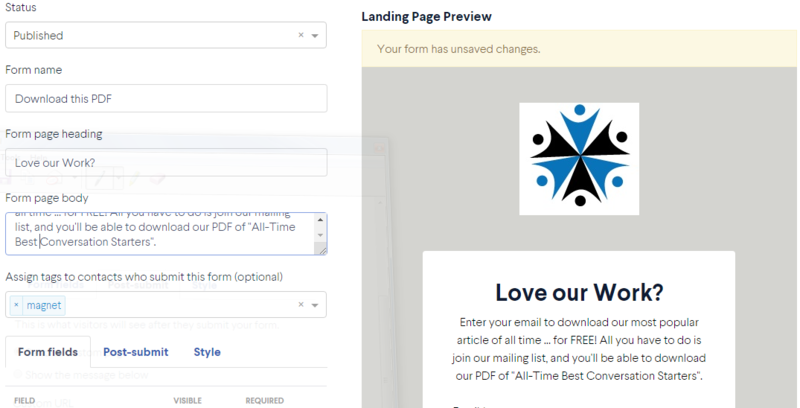 In the form page heading field, make sure you enter something that attracts the attention of your clients. In the body, explain why you want them to enter their details. 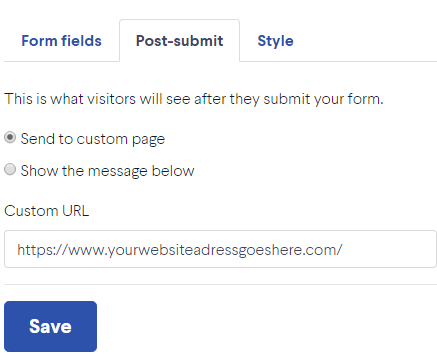 Once you're happy with the copy, choose the form fields you want clients to enter. Click on the tab: Post Submit and choose Custom Page. Enter the URL of your website where you want the clients to go once they've signed up and clicked Submit. When you're ready, change the status to Published and click Save to publish. The URL of your landing page will become available for you to share via email, social posts, social ads and more.